I don't remember playing dress up games when I was a child. Well, I guess I did rummage through my mum's dressing table and played with her makeup, but considering she was, and still is, not the type who likes to doll herself up, I didn't have much options to play with too. 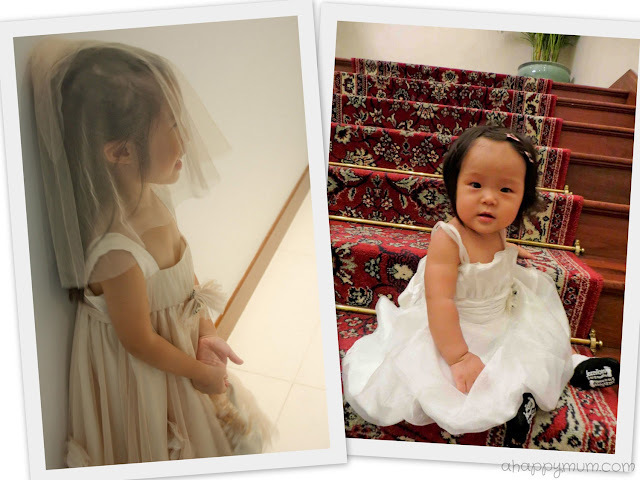 Just the other day, when Angel was dressed in her beautiful princess dress and said "Mummy, look, I wanna be the bride!" I was like "Ermm, ok, just pretend pretend only, right?" So I became the suave groom and we proceeded to do everything that she remembered from watching our wedding videos. And clearly, she remembered a lot. 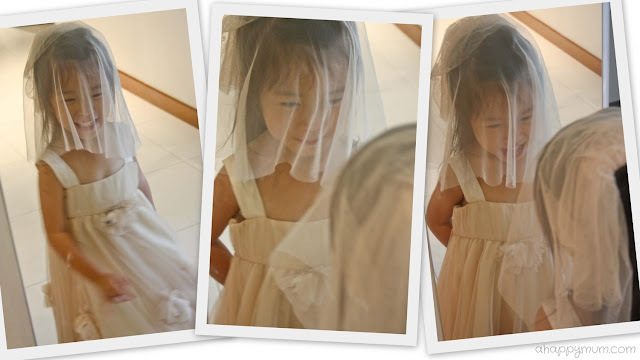 From the lifting of the bride's veil, the kiss, the holding of hands, the getting into bridal car, to the tossing of veil into the air and even eating of tang yuan (glutinous rice balls), ah huh, she could recall all of them. This girl has eidetic memory, I tell you. Both of you will make the most beautiful brides in Mummy's eyes, y'know that? Her favourite part, other than smiling at her mirror reflection, was the lifting of the veil. She looked so sweet, and perhaps even blushed, every time I bent over to give her a kiss. As silly as it might sound, even though it was only pretend play, there were so many sentiments that rushed through my head there and then. One day, my girls are going to fall in love. Will they meet a good boy? Will their hearts be broken? Will they be so head over heels in love and forget about us? One day, my girls are going to get married. What will I feel, as their mum, seated at the VIP table? Will I cry when I watch their childhood videos and realise how fast time has passed? Will I smile when looking at their baby pictures and realise they are babies no more? How will I survive without having them by my side every day? Yes, I can be quite emotional sometimes, the hubby can attest to it. I laugh easily but even the smallest thing can make my eyes well up with tears too. So, it's highly likely that I will be a wreck at their weddings. Over the weekend, I brought Ariel with me to a friend's wedding reception. After 14 years of being together, they are now finally husband and wife. A fairytale story with a happy ending. Both the bride and groom cried when giving their speeches, especially when giving thanks to their families and to each other. Love is the sweetest thing in the world, isn't it? Having experienced the wonders of it, I too pray that one day my girls can find true love. And if their hearts do get broken along the way, I hope I can be there to grieve, to learn and to fix the broken pieces with them. Anyway, I couldn't resist asking Angel this burning question. So, who do you want to marry in future? While she might be only four years old, she gives me the most amazing answers at times and I was half thinking maybe she would quote one of the boys' names in her class or that male teacher that she says she likes. Without even thinking about it, she gave me this reply. I know who I want to marry. I want to marry Papa, Mama and Meimei. Yes, my heart melted just like how it did on my wedding day. Thanks sweetie for saying that, even if this line is likely to change as the years go by. Thank you for not just saying Daddy, but for remembering me and even your dearest little sister too. It was one of the sweetest things you have ever said and Mummy just wishes to remember that feeling of you whispering those loving words into my ear while giving me the biggest hug ever. Oh, and for the record, I do. Thanks Estella! =) We are lucky to have girls, hee! Thanks Sophie! Oh yeah, that memory of hers, I have a feeling she just takes after me. Haha. Sweet.. Angel and Ariel will be two pretty brides for sure! Thanks babe! You think so? Awww. Muaks! That's so sweet! I was never into weddings or brides as a child (and here I am, a single mama, funny how life goes! ), but she looks like she had so much fun! And a great memory! Haha yes funny where life takes us sometimes! She did enjoy the whole session a lot, and insisted on playing it again and again! =) Thanks for stopping by! Oh yeah, fingers and toes crossed that they find themselves in good hands in future so I have one less worry. =) Thanks so much for leaving a comment! Hello! Your kids are so adorable! My 21 month old is starting to love pretend-play and dolls. 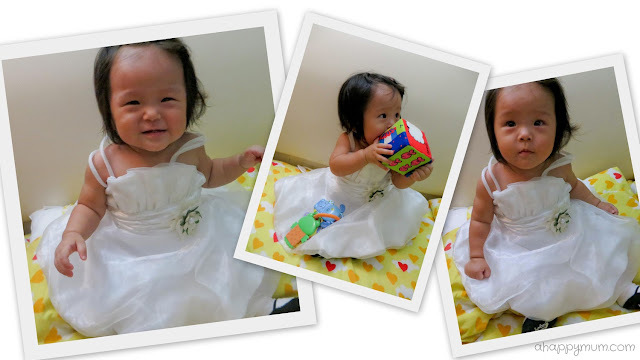 I think she will be a girly girl :) Looking forward to more mother-daughter's time! Yes mother-daughter time is so precious, there's nothing like it! =) Thanks for dropping by and I hope you two will have lots of fun and laughter playing! My little boy keeps saying he is going to marry me, and I feel mean every time I say he can't cause I'm already married!